The e-MFP Investors Action Group results from the enlargement of the former e-MFP Investors in Tier 2&3 MFIs Action Group. Its aim is to provide a platform for a broad spectrum of investors (debt & equity, social and commercial) to share experiences and collaborate on areas of common interest. In partnership with NpM, Platform for Inclusive Finance and the Financial Inclusion Equity Council (FIEC), the Action Group is exploring the question of how social investors committed to advancing responsible finance practices should exit responsibly from the MFIs in which they have invested over the years. The Action Group has partnered with SPTF and CDC in a joint project that has as objective consolidating the information available on how to evaluate social and environmental performance management (SPM) for FSPs financing SMEs. In order to do so, the project aims to map the relevance and applicability for SME finance of the USSPM, MIV due diligence tools and other frameworks, identify possible gaps and provide indications on how to fill the gaps. Since 2015, the Action Group organises trainings for investment officers with a two-fold objective: increasing the officers’ capacity on different aspects related to due diligence and improving networking among officers in order to facilitate the sharing of main conclusions of due diligence between the key MIVs, and thus, ultimately, improve the social and financial performance of MFIs. Delivered by Alex Silva and Georgina Vázquez, from OMTRIX, this training took place on November 16th 2016, in the framework of the European Microfinance Week. Delivered by Gabriel Metz and Patrick Gobin, eCacaoS, the training took place on November 18th 2015, in the framework of the European Microfinance Week. 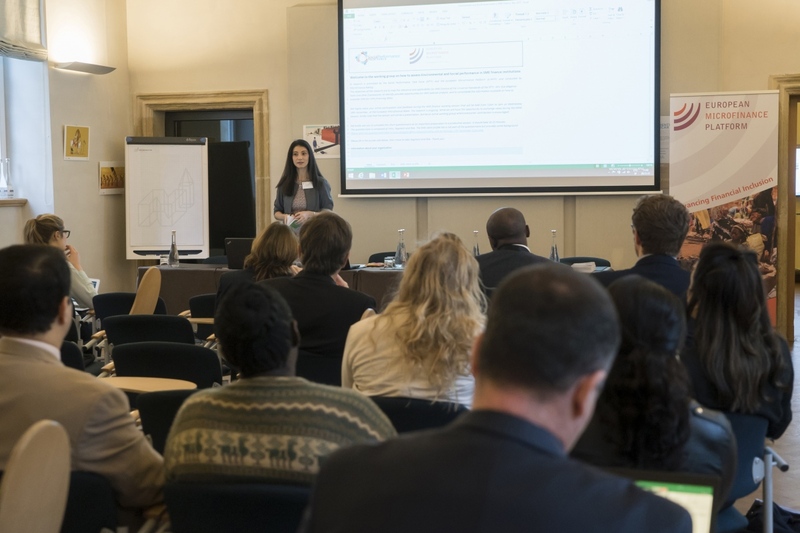 The training was organized again on April 11th 2016 in The Hague in partnership with Npm, Platform for Inclusive Finance and Cordaid. Delivered by Gregory Thys and Charles Cordier, from Azimut Inclusive Finance, the training took place on July 3rd 2015 in Dakar, in the framework of the African Microfinance Week. In 2016-2017 the Action Group partnered with SPTF and its Outcomes Working Group in order to develop guidelines for integrating outcomes measurement into the operations of inclusive finance investors. The Guidelines, published in October, can be found below under “Action Group Publications”.